Now that we have put the house up for sale I cleared up the garden this morning. 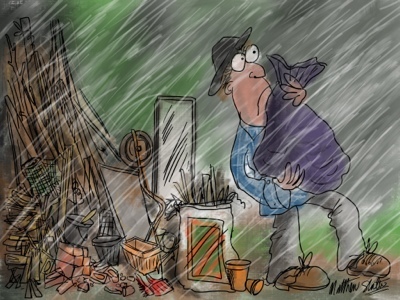 As often seems to happen whenever I have a load of stuff that needs to be carried through the house and into the car it was pouring with rain. Washed floors. Bricks, concrete, old double glazing panels, wood, light fittings, a wicker bookcase and other bits of stuff all went to the dump.